The events listed below are open to the public. May 31 - June 12, 2019. "Amazing Morocco Tour." Fahtiem will be teaching at the Mediterranean Festival in Morocco. Contact Fahtiem 626-810-SHOW (7469) ASAP if interested. More information TBA. January 31, 2018 - Escondido, CA. Sohaila sponsored Fahtiem to teach a Master Class at her studio. March 25, 2018 - Brea, CA, at the Curtis Theater, "Shimmy Shakedown Festival." Fahtiem will be one of the international featured guest dancers. Starts 7:00 pm. See Flier. April 12-15, 2018 - Concord, CA . Rakkassah West at Centre Concord. Fahtiem will be teaching on Thursday, April 12, at 7:30 pm. and Sunday, April 15, at 9:30 am. She will be performing during the show. Performance Day and Time TBA. Contact Shukriya for more information 510 724 0214. July 8, 2018 - Anaheim, CA.- At the Olive Tree Restaurant, 518 S. Brookhurst St. "Fez Nights 2," Fahtiem will be a featured performer. Doors open at 5:00 pm, show starts at 6:00 pm. For tickets go to www.roxxanne.net. All performers are dancing to live music. July 31, 2018 - Los Angeles, CA. "L.A. Legends of Bellydance," a week-long bellydance intensive. Fahtiem will be teaching on Tuesday, July 31 from 3:15-4:45 pm. For more information contact Jenna 323 660 4556 at Dance Garden LA. August 3, 4 and 5, 2018. Fontana, CA. "Oasis Dance Magic." Special Guest Artist, Tamlyn Dallal, will be teaching workshops as well as performing in the Saturday Gala Show. Three different shows and 10 hours of workshops. Get tickets online. October 12, 13 and 14, 2018.- New Jersey - Rakkasah East - Fahtiem will be teaching workshops and she will be performing. Call 908 996 0269 (Michelle De Vine). November 3 and 4, 2018 - Glendale, CA. - Winter Cairo Shimmy, presented by Diamond Pyramid at the Glendale Civic Auditorium. Fahtiem will be perfoming on Saturday, Nov 3, in the Gala Evening Show. She will be teaching a workshop on Sunday, Nov 4, from 3:15 to 5:15 pm. Go to www.wintercairoshimmy.com for more information. March 4, 2017 - Duarte, CA. "Ole, Ole" 7:00 pm. Fahtiem will be performing to Live Music. Wine, Lebanese and Middle Eastern Appetizers will be served. Space is limited. Call 626 825 6164 for reservations. April 7, 8 and 9, 2017 - Concord, CA . Rakkassah West at Centre Concord. Fahtiem will be teaching on Sunday, April 9, at 9:30-11:00am. She will performing during the show. Performance Day and Time TBA. Contact Shukriya for more information 510 724 0214. June 25, 2017 - Los Angeles, CA, "Moon of Tunis" - Fahtiem will be performing. Show starts at 8:00pm. More info to follow. August 7, 2017 - Los Angeles, CA. "L.A. Legends of Bellydance," a week-long bellydance intensive. Fahtiem will be teaching from 3:15 - 4:45 pm on Tuesday, August 8, 2017. For more information contact Jenna 323 660 4556 at Dance Garden LA. August 11, 12 and 13, 2017. Fontana, CA. "Oasis Dance Magic." Special Guest Artist, Sadie, will be teaching workshops as well as performing in the Saturday Gala Show. October 12 - 15, 2017. New Jersey - Rakkasah East - Fahtiem will be teaching workshops Thursday, October 12 at 12:00 Noon and on Saturday, Oct 14, 9:30 - 11:00 am, and she will be performing on Saturday at 5:00 pm. Call 908 996 0269 (Michelle De Vine) or 510 724 0214 (Shukriya) for more information. November 19, 2017. Buena Park, CA. Dr. Samy's #6 New CD Release Party . Fahtiem was honored to present one of his new songs. March 10-13, 2016 - Richmond, CA - "Rakkassah West" at the Richmond Auditorium. Fahtiem will be teaching on Thursday, March 10 at 3:45 pm and Sunday March 13 at 9:30 am, and performing on the main stage. Contact Shukriya for more information 510 724 0214. March 20, 2016 - Hermosa Beach, CA., Hermosa Beach Playhouse Theater, "Shimmy Shakedown." Fahtiem will be one of the international featured guest Dancers. See Flier for more info. May 20-22, 2016 - Salt Lake City, UT, Thia is sponsoring Fahtiem to teach 2 days of Empowering Bellydance Seminars and she will be starring in a Gala Show on Friday, May 20. Contact Thia at 801 266 0473 for more information or email thiak@earthlink.net. June 4 & 5, 2016 - Glendale, CA. Fahtiem will be teaching and performing at "Cairo Shimmy Quake." Glendale Civic Auditorium. August 1-5, 2016 - Los Angeles, CA. "L.A. Legends of Bellydance," a week-long bellydance intensive. Fahtiem will be teaching from 3:30 - 5:00 pm on Tuesday, August 2 - See Flier for more details. August 6, 2016 - Seattle, WA. "Oriental Bliss." Sponsored by Roxy. Fahtiem taught a workshop and performed in the show. August 12-14, 2016 - Fontana, CA. "Oasis Dance Magic," Special Guest Artist, Jillina, will be teaching workshops as well as performing in the Saturday Gala Show. More information TBA. October 13-16, 2016 - New Jersey - Rakkasah East - Fahtiem will be teaching workshops Friday, October 14 at 12:30-2:30pm and on Sunday, Oct 16, 9:30-11:00am, and she will be performing on Saturday at 2:48. Call 908 996 0269 (Michelle De Vine) or 510 724 0214 (Shukriya) for more information. November 6, 2016 - Alhambra, CA. Anisa presents her annual "King Tut Returns" Dinner and Show at Wahid's Middle East Restaurant. Fahtiem will be a featured performer. Doors open at 5:30, Dinner starts at 6:00 pm. For ticket information, call Fahtiem at 626-810-SHOW (7469). Dec 4, 2016 - Long Beach, CA. Belly Dancer of the Universe Competition "Dance for Universal World Peace." Tonya's 27th Annual Spirit of Christmas Party and BDUC Fundraiser at The Gaslamp Restaurant. Fahtiem will be a featured dance performer. Tickets available thru ticketweb.com. March 12-15, 2015 - Richmond, CA. - Rakkassah West, at the Richmond Auditorium. Fahtiem will be teaching on Thursday, March 12, at 3:45 pm and Sunday, March 15, at 10:00 am and performing on the main stage at 5:48 pm on Saturday, March 14. Contact Shukriya for more information 510 724 0214. March 21-24, 2015 - Mooresville, North Carolina - "Road Trip 2015 with Fahtiem." Fahtiem will be teaching two whole days of workshops and performing in the Gala Show. Go to www.pyramidroad.com for more information. Sponsored by Zuleikha. May 31, 2015 - Buena Park, CA - Shimmy Shakedown. Fahtiem will be one of the featured guest dancers. Dinner at 5:00 pm, Show at 6:00 pm. For info call Irene 562 677 6439. Call Fahtiem for tickets 626-810-SHOW (7469). August 7, 8 and 9, 2015. Fontana, CA. OASIS DANCE MAGIC - Save the dates! A weekend of Magical entertainment with Extraordinary performers including Special Guest Artist and instructor Virginia of Miami. Three SHOWS: Friday Night Cabaret, Saturday Night Gala Show, Sunday Evening Tribal Fusion. WORKSHOPS Saturday and Sunday. VENDORS for shopping. September 10-13, 2015 - Las Vegas, NV. Las Vegas Intensive. Fahtiem will be one of the headliners, teaching and performing, at the Flamingo Hotel. For Information call Samira at 888-587-2578. October 8-11, 2015 - New Jersey - Rakkasah East - Fahtiem will be teaching workshops and performing. Call 908 996 0269 (Michelle De Vine) or 510 724 0214 (Shukriya) for more information. November 7, 2015 - Duarte, CA. Fahtiem will be a special guest dance artist at "Ole, Ole!" For more information, call Fahtiem 626 810 SHOW (7469). November 20-24, 2015 - Tokoyo, Japan - Sponsored by Sadia and Salma/ BellyqueenJapan. Fahtiem will be doing workshops and performing. More information TBA. December 6, 2015 - Long Beach, CA. "Spirit of Christmas Extravaganza." Fahtiem will be a Special Guest Dance Artist. For information and reservations, contact Tonya and Atlantis at 562 433 6615. March 12-16, 2014 - Richmond, California. Rakkassah West, at the Richmond Auditorium. Fahtiem will be teaching on Thursday at 7:00 pm and Sunday at 10:00 am and performing on Sunday at 2:50 pm on the main stage. Contact Shukriya for more information 510 724 0214. March 20-23, 2014 - Ocean City, Maryland - at the 4th Annual "Art of the Belly" bellydance festival. Fahtiem will be a featured instructor and performer. For more information go to www.artofthebelly.com. April 25-27, 2014 - Miami, FL - Two day workshop and performance. For more information, contact Kahreen and Kira at Kirakismet@att.net. 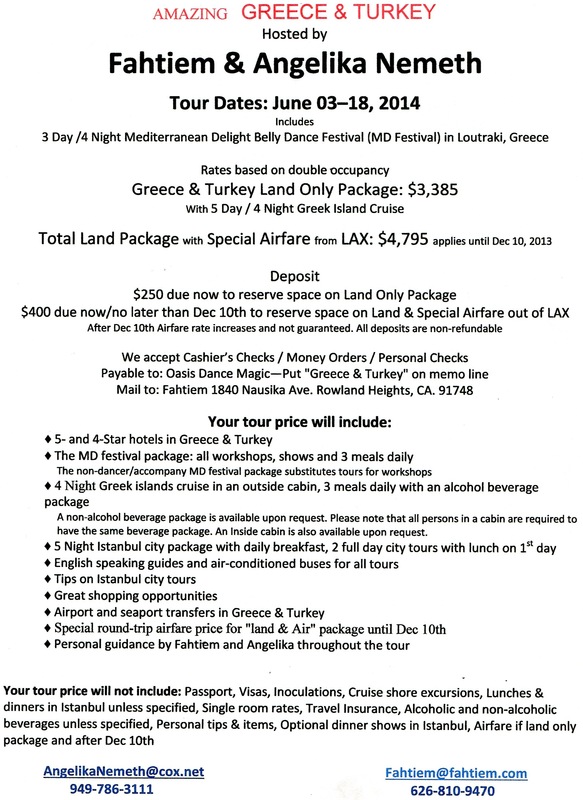 June 3-18, 2014 - Greece / Turkey - Fahtiem will be one of the guest Master Instructors at the Mediterranean Delight Festival in Greece during the "Amazing Greece and Turkey Tour" hosted by Fahtiem and Angelika. Call Fahtiem 626 810-9470 or 626-810-SHOW (7469). August 8, 9 and 10, 2014 - Fontana, CA. OASIS DANCE MAGIC - Save the dates! A weekend of Magical entertainment with Extraordinary performers including Maryam Raks Sharqi and Nicole McLaren (this year's guest instructors.) Three SHOWS: Friday Night Cabaret, Saturday Night Gala Show, Sunday EveningTribal Fusion. WORKSHOPS Saturday and Sunday. VENDORS for shopping. For info Call Fahtiem: 626 810-9470 or 626-810-SHOW (7469). August 31, 2014 - Glendale, CA - "Cairo Nights Show" at 6:00pm - Fahtiem will be one of the International Superstar guest artists in a special performance produced by Dr. Samy Farag at "Beyond the Stars Palace." October 16-19, 2014 - New Jersey - Rakkasah East - Fahtiem will be teaching workshops on Thursday at 7:00 pm and Saturday at 10:00 am, and performing on Saturday afternoon at 3:16 pm. Call 908 996 0269 (Michelle De Vine) or 510 724 0214 (Shukriya) for more information. November 2, 2014 - Sherman Oaks, CA - Anisa's School of Dance, 14252 Ventura Blvd. Fahtiem will be a featured performer at the 19th Annual "King Tut Returns" Dinner and Show. Call Fahtiem for dinner/show reservations at 626 810-9470 or 626-810-SHOW (7469) or Anisa at 818 908 8008. December 7, 2014 - Long Beach, CA - Tonya's Annual Spirit of Christmas Extravaganza at Khoury's Restaurant - Fahtiem will be one of the guest dancers in the Show from 3:00 - 7:00 pm. For more information call 562 433 6615. January 15, 2013 - North Hollywood, CA - Fahtiem will be performing at "Love For Laura," A BENEFIT FOR LAURA CRAWFORD, at Skinny’s Lounge, Doors: 6:45 PM, Show: 7:30 PM. For more info Call Fahtiem 626 810-9470 or 626-810-SHOW (7469). January 18, 2013 - Fairbanks, Alaska - Fahtiem will be teaching and performing. Details to follow. More info here. March 13-17, 2013 - Richmond, California. Rakkasah West, at the Richmond Auditorium. Fahtiem will be teaching and performing. Contact Shukriya for more information 510 724 0214. April 13, 2013 - Fullerton, California. Market at the Casbah. Workshop with Fahtiem at 1:30 pm on Saturday. Contact Deborah 949 742 0929 or see website www.marketatthecasbah.com. April 25, 2013 - Montebello, California. Fahtiem will be lecturing at 4:30 pm on Thursday, April 25th on the subject of "Self Esteem." For details contact Fahtiem at 626 810-9470 or 626-810-SHOW (7469). August 23, 24 and 25, 2013 - Fontana, CA, Oasis Dance Magic. Workshops and 3 shows. This year's guest workshop artists include Ava Fleming, DaVid,TerriAnne Gutierrez, and Jodi Waseca. More information TBA. September 2013 - POSTPONED - 4 day, 3 night Baja Cruise to Ensenada, Mexico. Fahtiem will be teaching and performing. For information call Michele Nicola 925 458 3300 or 925 777-9463. September 26-29, 2013 - New Jersey - Rakkassah East - Fahtiem will be teaching workshops on Thursday at 7 pm and Saturday at 10 am, and (just added: Cane) Sunday at 10 am, and performing Saturday at 6:48 pm. Call 908 996 0269 (Michelle De Vine) or 510 724 0214 (Shukriya) for more information. October 6, 2013 - Buena Park, CA - Shimmy Shakedown. Fahtiem will be a guest dancer. Dinner at 5:00 pm, Show at 6:00 pm. For info call Irene 562 677 4764. Call Fahtiem for tickets at 626 810-9470 or 626-810-SHOW (7469). November 3, 2013 - Sherman Oaks, CA - Anisa's School of Dance, 14252 Ventura Blvd. Fahtiem will be a featured performer at the 18th Annual "King Tut Returns" Dinner and Show. Call Fahtiem for dinner/show reservations at 626 810-9470 or 626-810-SHOW (7469) or Anisa at 818 908 8008. December 1, 2013 - Long Beach, CA - Fahtiem will be a guest performer at Tonya's "Spirit of Christmas" Party - Sunday, 4 to 8 pm at Khoury's Restaurant, 110 N Marina Drive, Long Beach, CA 90803. Tickets at the door, cash only. $30 for dinner and show. First come first served. Doors open at 4 pm, show starts at 6 pm. December 16, 2013 - Long Beach, CA - 7:30 pm. Fahtiem's Annual Christmas Pot Luck with John Bilezikjian and special guest artists. Please bring a dish and call for reservations 626 810-9470 or 626-810-SHOW (7469). Reservations are required. 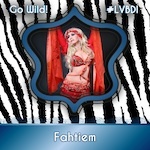 January 29 - February 4, 2012 - Big Island, Hawaii - Fahtiem will be teaching and performing at a weeklong event - "The Beautiful Belly Dance Retreat" - by Delilah of Seattle. For more information, contact Delilah at 206 632 2353. February 12, 2012 - Newport Beach, CA. at Tapas Restaurant and Night Club. Fahtiem will be the featured performer in "The Jewels that Raq" dinner show. Contact Fahtiem 626 810-9470 or 626-810-SHOW (7469) or Meliza 949 756 8194 for reservations. March 9-11, 2012 - El Segundo, CA. Little Egypt presents "Stars of Spring." Fahtiem will be a featured performer on Friday, March 9. Doors open at 8:00, Show starts at 8:30pm. A weekend filled with workshops by Aida Nour, Camelia and Khaled Mahmoud. For workshops and weekend packages, visit www.littleegypt.com. Show will be held at the Hacienda Hotel and Conference Center, Los Angeles Airport, 525 N Sepulveda Blvd, El Segundo, CA. For Friday night show tickets and info, call Fahtiem, 626 810-9470 or 626-810-SHOW (7469). March 15-18, 2012 - Richmond, California. Rakkassah West, back at the Richmond Auditorium. Fahtiem's Workshops will be on Thursday, March 15 from 1:30-3:30pm and Saturday, Mach 17, from 10-11:30 am. Fahtiem's performance time TBA. Contact Shukriya for more information 510 724 0214.July 22, 2012 - San Diego, CA. SAMEDA Faire 2012 - Fahtiem will be teaching and performing. See Flier for details. August 3-5, 2012 - Fontana, CA, Fahtiem's OASIS DANCE MAGIC returns. Save the date! A weekend of magical entertainment with extraordinary performers. Three Shows: Friday Night Cabaret, Saturday Night Gala Show, Sunday EveningTribal Fusion. Workshops Saturday and Sunday. Vendors for shopping. For info Call Fahtiem: 626 810-9470 or 626-810-SHOW (7469). August 17-19, 2012 - Dallas, Texas - Fahtiem (Back by Popular Demand) will be doing a workshop and show at "Yaa Halla, Y'All," A Gathering of the Stars, presented by Isis. Call 888 918 4747 for more information. September 9, 2012 - Las Vegas, NV - Las Vegas Intensive. Fahtiem will be a special guest artist, teaching Sunday Morning and performing Sunday Evening, at the Flamingo Hotel. For Information call Samira at 888-587-2578. September 15 & 16, 2012 - Maryland - WAMEDA presents Fahtiem in a 2-day workshop and show at their Hafla 2012. For more information Anna Vermillion. September 22, 2012 - Eagle Rock, Ca - "Taxim" at Studio Iqaat - Fahtiem is the special guest star. For more information contact Fahtiem at 626 810-9470 or 626-810-SHOW (7469). October 10-15, 2012 - New Jersey - Rakkassah East - Fahtiem will be teaching workshops on Thursday, Oct 11 from 3-5:00 pm and on Sat, Oct 13 at 10:00 am. Fahtiem will be performing at 3:43 pm on Sat, Oct 13. Call 908 996 0269 (Michelle De Vine) or 510 724 0214 (Shukriya) for more information. November 4, 2012 - North Hollywood, CA - Fahtiem will be a featured performer at the 17th Annual "King Tut Returns" at the Serrano Club - Dinner and Show. Call Fahtiem for dinner/show reservations at 626 810-9470 or 626-810-SHOW (7469). Fahtiem will be performing to live music with Gamal Gomaa and his Orchestra. February 13, 2011 - Newport Beach, CA. at Tapas Restaurant and Night Club. Fahtiem will be the featured performer in "The Jewels that Raq" dinner show, 6:00-9:00 pm. Contact Fahtiem 626 810-9470 or 626-810-SHOW (7469) or Meliza 949 756 8194 for reservations. March 4, 2011 - El Segundo, CA. Fahtiem will be performing at the Hacienda Hotel and Conference Center, Los Angeles Airport, 525 N Sepulveda Blvd, El Segundo, in "Stars of Spring," presented by Little Egypt. Doors open at 8:00, Show starts at 8:30pm. A weekend filled with workshops by Randa Kamel, Lubna Emam, and Dr. Mo Geddawi. For Friday night show call Fahtiem, 626 810-9470 or 626-810-SHOW (7469), tickets $20. For workshops and weekend packages, visit www.littleegypt.com. April 30 and May 1, 2011 - Miami, FL - Two day workshop and performance. For more information, contact Kahreen and Kira at Kirakismet@att.net. June 3-5, 2011 - Long Beach, CA - "Cairo Caravan" on the Queen Mary, Fahtiem will be giving a lecture / workshop on Sunday, June 5 at 3:45 pm - "Inspiration, How to Find It, How to Be It." June 24 - July 2011: Fathiem will be teaching and performing in Egypt at the Ahlan Wa Sahlan Festival in Cairo, Egypt. Join Fahtiem & Angelika Nemeth for the AMAZING EGYPT & TURKEY tour. More Information. September 23-26, 2011 - 4 day, 3 night Baja Cruise to Ensenada, Mexico. Fahtiem will be teaching and performing. For information call Michele Nicola 925 458 3300 or 925 777-9463. October 13 and 15, 2011 - New Jersey - Rakkassah of the East - Fahtiem will be teaching workshops on Thursday, Oct 13 at 5:00 pm and on Sat, Oct 15 at 10:00 am. She will be performing Sat, Oct 15 at 3:43 pm. Call 908 996 0269 (Michelle De Vine) or 510 724 0214 (Shukriya) for more information. November 11, 2011 - Berlin, Germany. Fahtiem will be a judge, teacher and performer. Feb 28, 2010 - Costa Mesa, CA. 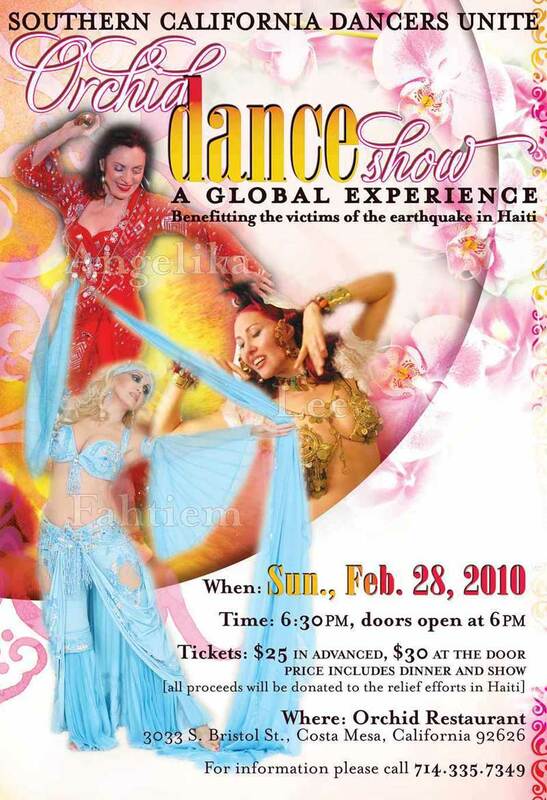 Fahtiem will be a special guest artist at the Orchid Dance Show, benefitting the victims of the eathquake in Haiti. 6:30 pm. For info and reservations, call 714 335 7349. Click here for flier. March 7, 2010 - San Diego, CA. Lucia presents Fahtiem in a workshop from 2:00 - 4:00 pm, and show from 8:00 - 11:00 pm. Call 619 405 2308 for more information. March 11 and 14, 2010 - Richmond, California. Rakkassah West, back at the Richmond Auditorium. Performance and workshop by Fahtiem. On March 11, Fahtiem will be teaching in the evening at 7:00 pm and she will be performing on Sunday, March 14, at 2:50 pm. Contact Shukriya for more information 510 724 0214May 22 , 2010 - Santa Barbara, CA. Fahtiem is a special guest artist at UC Santa Barbara Spring Concert. Contact Alexandra King at Alexandra@alexandraking.com for more info. June 22 - July 10, 2010: Egypt and Israel. AMAZING EGYPT & ISRAEL with Fahtiem & Angelika Nemeth. Includes the Ahlan Wa Sahlan Festival in Cairo. See Flier. September 9-12, 2010 - Las Vegas, NV. Las Vegas Intensive. Fahtiem will be a special guest artist, teaching and performing, at the Flamingo Hotel. For Information call Samira at 888-587-2578. October 6-7, 2010 - New Jersey - Rakkassah of the East - Fahtiem will be teaching workshops on Thurs, Oct 6, 1:00-4:00 pm and on Fri, Oct 7, 12:00 noon - 2:00 pm.. She will be performing Fri, Oct 7. time TBA. Call 908 996 0269 (Michelle De Vine) or 510 724 0214 (Shukriya) for more information. October 23, 2010 - Cleveland, Ohio. Call Cassandra Al Warda 216 970 6153 for reservations. Fahtiem will be doing a workshop during the day and a show at 8:00 pm on Saturday, Oct 23. Print Flier. November 7, 2010 - Temecula, CA. "Bellydance Bene-Fest," honoring John Bilezikjian. 12 NOON to 5:00 pm. Tickets available - call 800 854 5177 or 909 223 9932. Fahtiem will be a featured performer. Print Flier. November 7, 2010 - Sherman Oaks, CA. Fahtiem will be a featured performer at "King Tut Returns" - 7:00 pm. Dinner/Show. Tickets can be obtained from Fahtiem or call Anisa at 818 908 8008. Print Flier. December 13, 2010 - Long Beach, CA - Annual Christmas Pot Luck with John Bilezikjian and special guest artists. Please bring a dish and call for reservations 626 810-9470 or 626-810-SHOW (7469). March 8-15, 2009, Vallejo, California, Rakkassah West, Performance and workshop by Fahtiem. Contact Shukriya for more information 510 724 0214. April 18 and 19, 2009 - Miami, FL - Two day workshop and performance. For more information, contact Kahreeen and Kira at Kirakismet@att.net. June 13 and 14, 2009 - Long Beach - on the Queen Mary - Fahtiem will be teaching workshops and performing at MECDA's Cairo Caravan. June 24 - July 8, 2009 - Egypt - Fahtiem will be TEACHING at Ahlan Wa Sahlan Festival! You are invited to CELEBRATE AND EXPLORE THE MAGIC OF EGYPT! Experience Egypt’s Exciting World of DANCE! -- Tour PLUS Ahlan Wa Sahlan Festival. July 18, 2009 - Los Angeles, CA - at Iqaat, 3515 Eagle Rock Blvd, 90065. Doors open at 7:00 pm. Fahtiem will be performing with dance artists including Ozgen (male Turkish dancer from the UK), Princess Farhana, Tamra Henna, and Aubre. Show starts at 7:30 pm. September 13, 2009 - Newport Beach, CA - Fahtiem will be a special guest star at "The Jewels That Raq" Show at Tapas Restaurant, 4253 Martingale Way, Reservations Required 949-257-6132 or 949-756-8194. $12.00 Cover Charge. If you are coming for dinner, please be there by 6:00 pm. If you are planning to attend the show only, it starts at 7:00 pm sharp. October 3 and 4, 2009 - St. Louis, MO, Fahtiem in Workshop and Show, sponsored by Simone's Veils. Call Andrea for more info at 636 282 9348. Oct 15 at 1:00 pm and on Fri, Oct 16 at 1:00 pm. She will be performing Sat, Oct 17 at 3:47 pm. Call 908 996 0269 (Michelle De Vine) or 510 724 0214 (Shukriya) for more information. November 1, 2009 - Sherman Oaks, CA - Fahtiem will be performing for Anisa's Big Birthday Bash. 6:30 - 10:30 pm. $35.00 per person. November 6, 7 and 8, 2009 - Chicago - "Chicago Raks" presented by Raksanna. Fahtiem in 2-day Workshops and Show. Call 630 689 3611 for more information. December 14, 2009 - Long Beach, CA - Annual Christmas Pot Luck with John Bilezikjian and special guest artists. Please bring a dish and call for reservations 626 810-9470 or 626-810-SHOW (7469). January 11, 2008 - Sherman Oaks, CA - Anisa's Arabian Knights - New Showcase at Anisa's School of Dance, 8:00 pm. Fahtiem will be the very special "Guest Star." Contact Anisa 818-908-8008 for info or anisa@anisadance.com. February 9, 2008 - Las Vegas, NV. - Fahtiem will be performing in a show on February 9, 2008 "Fahtiem in Las Vegas" is a showcase of Middle Eastern Dance Professionals. Call Samira 702 296 9269 for more information and reservations. 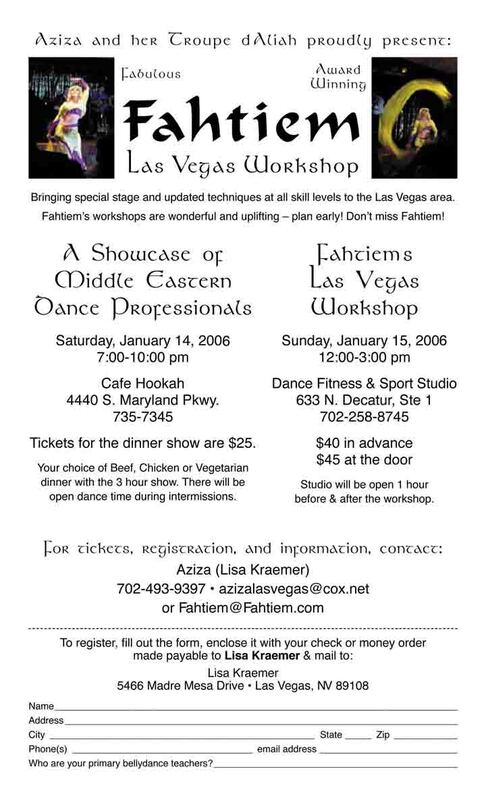 February 10, 2008 - Las Vegas, NV - Fahtiem will be teaching a workshop from 12:00 - 3:00 pm. Call Samira 702 296 9269 for more information and reservations. March 9, 2008, Los Angeles, CA., at Dance Garden LA, 3407 B Glendale Blvd, Workshop with Fahtiem. 2:00-4:00 PM,"Beautiful Hands and Arms." March 16, 2008, Vallejo, California, Rakkassah West, in the West Building, at 3:16 pm, performance by Fahtiem. Contact Shukriya for more information 510 724 0214. March 29, 2008, Huntington Beach, CA, Fahtiem in Show at 8:00 pm., at Global Rhythms Dance Studio, 10184 Adams Ave. Contact Carolyn for more info 714 400 8454 or CairoCarolyn@yahoo.com April 19, 2008 - Columbus, Ohio - Rescheduled. Check back for information. -- Workshop and Show. May 3, 2008, Chisolm, Minnesota. Fahtiem starring in ORIENTAL NIGHTS VII. Shirley Taramelli proudly presents the 7th Annual Middle Eastern Dance Show, Saturday Workshop and Saturday Evening Show. For more information: Call 218 - 254 - 3059 or shirleyt@hibbingmn.com May 18, 2008, Glendale, CA. RAQS LA, at the Glendale Civic Auditorium, Fahtiem perfoming on the Inside Bazaar Stage at 2:40 pm. May 23-26, 2008 - Camp Greenlane, Green Lane, Pennsylvania - Folk Tours Middle Eastern Music and Dance Camp. Fahtiem in workshop and show presented by Artemis and Folk Tours. Email info@folktours.com for more information or go to www.folktours.com. June 8, 2008, Santa Anita Race Track, CA, Fahtiem will be performing on Sunday, at 2:16 p.m at Cairo Carnivale on the Inside Bazaar Stage. For more info, see www.mecda.org. June 13-15, 2008 - United Kingdom - Bellydance Superstars presents international Superstar special guest, Fahtiem, at Raqs Britannia, in workshops and show. Blackpool, United Kingdom. Go to www.raqsbritannia.co.uk for more info. August 15, 16 and 17, 2008 - Dallas, TX, Fahtiem will be doing a workshop and show at "A Gathering of the Stars," presented by Isis. Call 888 918 4747 for more information. Back by Popular Demand! September 19-22, 2008 - 4 day, 3 night Baja Cruise to Ensenada, Mexico. Fahtiem will be teaching and performing. For information call Michele Nicola 925 458 6697 or toll free 800 889 4795. 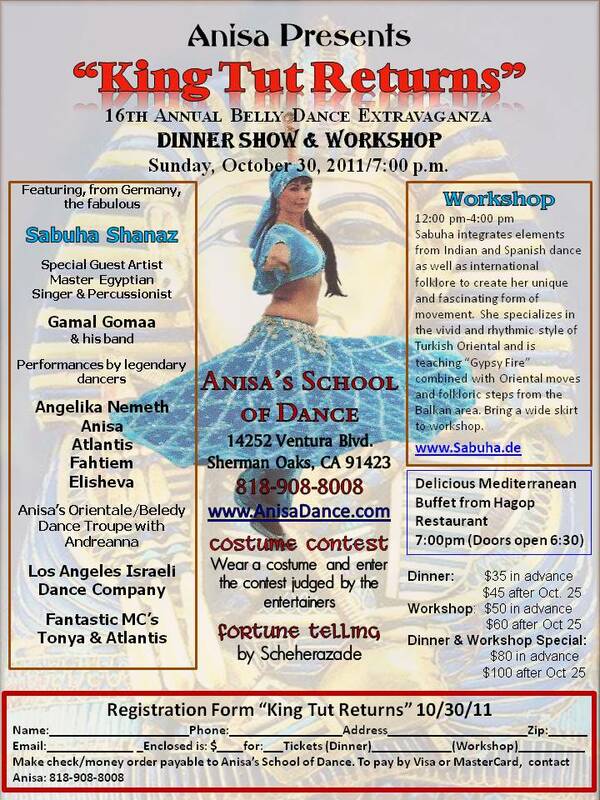 September 26, 2008 - Sherman Oaks, CA - Anisa's Arabian Knights - Showcase at Anisa's School of Dance, 8:00 pm. Fahtiem will be the very special "Guest Star." Contact Anisa 818-908-8008 for info or anisa@anisadance.com. October 16 - 18, 2008 - New Jersey - Rakkassah of the East - Fahtiem will be teaching a workshop Thursday, Oct 16 at 9 AM and Friday, Oct 17 at 10:35 AM. She will be performing on Saturday, Oct 18 at 2:43 PM. Call 908 996 0269 for more information. November 2, 2008 - Dallas, TX - Fahtiem will be performing for Samy Farag's New CD release party. For information call Isis 888 918 4747. November 8 and 9, 2008 - Wisconsin - Festival of the Dance - Workshop and Performance. Email PatKellar@juno.com for more information. December 15, 2008 - Long Beach, CA - Annual Christmas Pot Luck with John Bilezikjian and special guest artists. Please bring a dish and call for reservations 626 810-9470 or 626-810-SHOW (7469). January 27, 2007 - Whittier, CA - Uptown Kabob, The Oasis Showcase - Fahtiem will be performing. Doors open at 7:00 pm, Dinner 7:30, Show at 9:00 pm. Ticket price $30, includes show and dinner. Reservations required. Call Fahtiem 626 810-9470 or 626-810-SHOW (7469) for more information. February 10, 2007 - Las Vegas, NV. - Fahtiem will be performing in a dinner show at The Arthur Murray Dance Studio 7:00-10:00 pm. "Fahtiem in Las Vegas" is a showcase of Middle Eastern Dance Professionals. Call Samira 702 296 9269 for more information and reservations. February 11, 2007 - Las Vegas, NV - Fahtiem will be teaching a workshop at The Arthur Murray Dance Studio from 12:00 - 3:00 pm. Call Samira 702 296 9269 for more information and reservations. February 14, 2007 - Irvine, CA - Fahtiem with live music in Special Valentine's Day performance at Jimmy Z Grill. Two seatings: one at 6:30 pm and one at 8:30 pm. Gourmet Persian Inspired Mediterranean dinner and show. Call 949 737 6700 for reservations. March 10, 2007 - Fort Collins, CO - Fahtiem will be giving a workshop and show. For information call Coke 970 229 0542. March 14-15, 2007 - Richmond, CA - Rakkassah of the West. Fahtiem will be doing a workshop March 14th and 15th . Contact Shukriya for more information 510 724 0214. March 18, 2007 - Richmond, CA - Rakkassah of the West. Fahtiem will be performing on the main stage at 4:48 pm. Contact Shukriya for more information 510 724 0214. May 12-13, 2007 - Orange County, CA - "Mahrajan - Celebrating Dance Orientale." Fahtiem will be performing May 12, at 8:00 pm and May 13 at 3:00 and 7:00 pm. For information contact Angelika Nemeth 949 786 3111. June 9 & 10, 2007 - Arcadia, CA - Cairo Carnivale - Fahtiem will be dancing on the inside stage at 2:23 pm on Sunday. Please stop by and say "Hi" at her vendor's booth both days. July 8th, 2007. Egypt – Tour PLUS Ahlan Wa Sahlan Festival. August 3-5, 2007 - Albuquerque, NM - "Shake 'N Bake" Festival. Fahtiem will be performing on Saturday evening, Aug 4th - show starts at 8:00 pm. She will be teaching on Saturday, Aug 4 from 1:00-5:00 pm. Contact Amaya at 505 281 4492 for more information and reservations. August 11 and 12, 2007 - Anaheim, CA, at the Phoenix Club OASIS DANCE MAGIC. Special guest artists Rachel Brice and Virginia of Miami. Spectacular Gala Show August 12th. For more information, call Fahtiem 626 810-9470 or 626-810-SHOW (7469). August 24, 25 and 26, 2007 - Orlando, FL - Fahtiem will be giving a workshop and performing in a show sponsored by Babylon Breeze Productions. For information 407 616 6313 or 800 802 3311. September 14-17, 2007 - 4 day, 3 night Baja Cruise to Ensenada, Mexico. Fahtiem will be teaching and performing. For information call Michele Nicola 925 458 6697 or toll free 800 889 4795. September 28-30, 2007 - London, England, International Bellydance Congress. Fahtiem will be teaching and performing. Contact Josephine Wise, www,bellydancecongress.com. October 8-15, 2007 - New Jersey - Rakassah of the East, Fahtiem will be teaching and performing . For more information 908 996 0269. October 28, 2007 - Van Nuys, CA - Fahtiem will be performing for King Tut Returns, Dinner and show, Halloween Bellydance Extravaganza. For info contact Anisa at 818 908 8008. For those who want to sit at Fahtiem's table, Call Fahtiem. 626 810-9470 or 626-810-SHOW (7469) November 4, 2007 - Gardena, CA - Fahtiem performed at a Special Beach Cities MECDA Event in support of John Bilezikjian. December 10, 2007 - Long Beach, CA - Annual Christmas Pot Luck with John Bilezikjian and special guest artists. Must call to attend. 626 810-9470 or 626-810-SHOW (7469). January 14 and 15, 2006 - Las Vegas, NV - Fahtiem in Workshop and Show. Contact Lisa Kraemer 702 646 5068. Click here for Flier January 27, 28 and 29, 2006 - Orlando, FL, Workshop and show sponsored by Babylon Breeze Productions. For information 407 616 6313 or 800 802 3311. February 14, 2006 - Irvine, CA - Fahtiem with live music in Special Valentine's Day performance at Jimmy Z Grill. Two seatings: one at 6:30 pm and one at 8:30 pm. Gourmet Persian Inspired Mediterranean dinner and show. Call 949 737 6700 for reservations. February 24, 2006 - Los Angeles, CA - Fahtiem will be performing at The Clarion Hotel at LAX, in a show presented by Little Egypt. Doors Open at 7:30, show starts at 8:00 pm. Call 972 840 8450 for reservations and information. March 19 and 20, 2006 - Richmond, CA - Rakkassah of the West. Fahtiem will be doing a workshop March 19th and 20th. March 26, 2006 - Richmond, CA - Rakkassah of the West. Fahtiem will be performing on Sunday, March 26th on the Main Stage at 3:26 pm. March 31, 2006 - San Diego, CA. Show from 8-10:00 pm. at the Woman's Club, 2557 3rd Avenue, Contact Lucia 619 405 2308. April 29, 2006 - Whittier, CA. Fahtiem presents Oasis Showcase. Fahtiem and many other dancers performing. at the Uptown Kabob Mediterranean Grill. Coctails at 8:00 pm, Showcase at 9:00, For info call Fahtiem at 626 810-9470 or 626-810-SHOW (7469). Print Flier April 30, 2006 - La Mirada, CA. Fahtiem and students performing at the La Mirada City Street Festival at 7:00 pm. For info call Fahtiem at 626 810-9470 or 626-810-SHOW (7469). May 9, 2006 - Los Angeles, CA. Fahtiem will present a workshop with Momo Kadous. For info call Fahtiem at 626 810-9470 or 626-810-SHOW (7469). Print Flier May 27 and 28, 2006, Mexico City, Fahtiem in Workshop and Show. Contact Mariashazadi@yahoo.com.mx for more information. June 3, 2006 - Indiana, Workshop and show. Contact Ruby Jazayre at 574 234 3355. June 10 and 11, 2006 - Arcadia, CA - Cairo Carnivale. Fahtiem will be performing on Sunday, June 11, at 2:00 pm. in the Main Bazaar. July 7, 2006 - Los Angeles, CA - Guest performance at Studio Iquaat, live music in "Taxim." Doors open at 7:30, show at 8:00 - $15 at door. Includes light refreshments. For more info call Jenna 213 739 3755. Mention Fahtiem when you call. September 22, 23, and 24, 2006 - Austin, TX - Fahtiem in Workshop and show. Contact Jeanette 512 441 4645 for more info. October 9-15, 2006 - New Jersey, Rakassah of the East, Fahtiem will be teaching on Thursday, October 12th at 9:00 a.m.and Friday, October 13th at 10:30. She will be performing on Saturday, October 14th at 5:46 p.m. For more information 908 996 0269. October 29, 2006 - Van Nuys, CA - Fahtiem will be performing for King Tut Returns, Dinner and show, Halloween Bellydance Extravaganza. For info contact Anisa at 818 908 8008. For those who want to sit at Fahtiem's table, Call Fahtiem. 626 810-9470 or 626-810-SHOW (7469). 2005 January 15-16, 2005 - Las Vegas, NV - Show at 7:00 PM at La Louisianne, Jan 15th. Workshop on Jan 16th between 12 - 3:00 pm. Contact Lisa Kraemer re: Workshop, 702 646 5068. Restaurant Reservations are required at La Louisianne: 702 869 3154. February 5, 2005 - San Diego, CA - Fahtiem will be performing at Hafla San Diego. For information call Jim Boz at 877-682-5873. February 14, 2005 - Irvine, CA - Fahtiem and Leila with live music in Special Valentine's Day performance at Jimmy Z's. One seating from 5:00 pm to 10:00 pm. Call 949 737 6700 for reservations. February 20, 2005 - Fahtiem will be judging at the Bellydancer of the Universe Competition in Long Beach, CA. Call Atlantis at 562 433 6615 for more info. February 26, 2005 - Long Beach. Fahtiem will be giving a demonstration for a Girl Scout Troop in Long Beach. February 27, 2005 - San Diego, CA - Fahtiem is performing in a benefit show for the Tsunami victims. March 19 and 20, 2005 - Richmond, CA - Rakkassah of the West. Fahtiem will be doing a workshop at 9:00 am on March 19 and performing on Sunday, March 20th on the Main Stage at 3:16 pm. April 17, 2005 - Pomona, CA - Leadership conference, Fahtiem will be doing a lecture/demonstration at the Palomares Community Center, 499 East Arrow Highway. For mroe information go to www.tribalfusiondance.com. April 19, 2005 - Los Angeles, CA - Fahtiem will be presenting Momo Kudus in a workshop at Dancer's Studio. Check in time 9:15 pm. Call Fahtiem for details. April 22-23, 2005, Long Beach, CA, Ragia Hassan Workshop and Show at the Holiday Inn. Fahtiem will be performing in the show on Saturday Evening. For info call 972 840 8450 or Fahtiem. April 29, 30 and May 1, 2005, Virginia Beach, VA - Workshop and show. Information to follow. June 11 and 12, 2005 - Glendale, CA - Fahtiem will be vending for the weekend at MECDA's Cairo Carnivale and performing on Sunday, June 12 at 1:20 pm upstairs on the Bazaar stage. July 9 and 10, 2005 - Riverside, CA - Fahtiem will be performing at Coffee Depot's Concert Hall, 3204 Mission Inn Avenue, Riverside, CA. Call Alexandra at 909 715 7225. July 21, 2005 - Pasadena, CA - 7:00 pm. Fahtiems' Sultan's Delites will be perfomring as part of a FREE live concert with Suzanne Teng, winner of Best World Music CD, at Levitt Pavilion. 85 East Holly Street. Call 626 683 3230 for more information. August 6 & 7, 2005, Oasis Dance Magic! Guest Insructors Amaya, award winning dancer; and Ava Fleming and many, many more. August 20 & 21, 2005, Dallas, Texas - Fahtiem will be doing a performance on Saturday evening the 20th and a Panel Discussion on the 21st at "A Gathering of the Stars," presented by Isis. Send in questions to ask the stars what you've always wanted to know. Call 888 918 4747 for more information. Back by Popular Demand! September 11, 2005 - Thousand Oaks, CA - Tracey Farmer Presents Fahtiem teaching a workshop at the Hillcrest Center for the Arts, from 11:00 am to 4:00 pm. Registration at 10:00 am. Call 805 520 5100, extension 2446 for more information. September 18, 2005 - San Jose, CA - Fahtiem will be teaching a workshop at the Desert Dance Festival at the San Jose Civic Auditorium, at 2:30 pm. For information, call Dunia 510 667 9333. September 23, 24, 25, and 26, 2005 - 4 day, 3 night Baja Cruise to Ensenada, Mexico featuring Fahtiem and special guest artists, TBA. For information call Michele Nicola 925 458 6697 or toll free 800 889 4795. October 2, 2005 - Alhambra, CA - Workshop with Fahtiem, 1:00 pm - 3:00 pm. Arte Flamenco Dance Theatre. Call Joanne 626 358 3547 for reservations and information. Sponsored by Troupe Sahira. October 8 & 9, 2005 - San Diego, CA - Bedouin Bazaar - Fahtiem will be teaching a workshop Saturday and Sunday, both days from 2:00 - 4:00 pm. For info call Scotty 858 581 0135. October 12-16, 2005 - New Jersey, Rakassah of the East, Fahtiem will be teaching on Wednesday and Thursday and performing on Saturday. For information 908 996 0269. October 30, 2005 - Sherman Oaks, Ca - Fahtiem will be performing for King Tut Returns, Dinner and show, Halloween Bellydance Extravaganza. Contact Anisa at 818 908 8008. December 12, 2005 - Long Beach Parks and Recreation, Wardlow Park, 3457 Stanbridge, Long Beach, California - Annual Christmas potluck for students and friends. Must call to attend. Live music by John Bilezikjian with guest dancers Jenna of New York, Annaheed, Inaya, Cyriana, Fahtiem and more. January 16, 17 and 18, 2004 - Las Vegas, NV - Fahtiem in Workshop and Show. Contact Lisa Kraemer 702 646 5068. February 6 & 7, 2004 - Salt Lake City, Utah - Midnight Mirage presents Fahtiem in show and workshop at the 3rd annual "Mirage in Winter." Call 801 401 9291 or dance@midnightmirage.com. February 14, 2004 - Irvine, CA - Fahtiem with live music in Special Valentine's Day performance at Jimmy Z's. One seating at 5:30 pm and another at 8:30 pm. Call 949 737 6700 for reservations. February 15, 2004 - Long Beach, CA - Fahtiem will be a judge for the Belly Dancer of the Universe contest. For info contact Atlantis 562 433 6615. March 13, 2004 - Riverside, CA - Fahtiem will be performing in "Save Our Critter Companions," a fundraiser Dinner/Show to aid Riverside Animal Services. Sponsored by Maarisa 909 934 0075. Call for reservations and information. March 21, 2004 - Richmond, CA, - Rakkasah of the West, Fahtiem will be perfoming Sunday, Mar 21, 2004 at 3:24 pm. Main Stage. Call 510 724 0214 for more information. March 26, 27 and 28, 2004 - Austin, TX - Workshop and show. "Shimmy Into Spring" - Contact Jeanette 512 441 4645 for more info. April 23, 24 and 25, 2004 - Atlanta, GA - Fahtiem in Workshop and Show. For info call Elisheva Zoheret at 770 222 1514. May 14, 2004 - Los Angeles, CA - Fahtiem will be performing at the Radisson Hotel at LAX. Little Egypt and Egypt World present Dina of Egypt. Fahtiem is in the All Star Show on Friday night, the 14th of May. For info call 800 801 0604. May 23, 2004 - Canoga Park, CA - Fahtiem will be performing at the West Valley Playhouse, Show starts at 6:30 pm. "Belly Dance Rocks". For info call Suzie Evans 818 343 4410. June 12 and 13, 2004 - Glendale, CA, Cairo Carnivale, Fahtiem will be performing on Sunday the 13th at 2:30 pm on the Bazaar stage upstairs. July 10 and 11, 2004 - Riverside, CA - Fahtiem will be performing at Coffee Depot's Concert Hall, 3204 Mission Inn Avenue, Riverside, CA. PH 909 715 7225. July 16, 17 and 18, 2004 - Gainesville, FL - Fahtiem will be teaching a workshop and doing a show. For info call Zarifa Sa'id 352 317 2678. August 26, 2004 - time and place TBA - Rhythm workshop for dancers with drummer Karim from Turbo Tabla. September 24-27, 2004 - 4 day, 3 night Baja Cruise to Ensenada, Mexico featuring Fahtiem and special guest artists, TBA. For information call Michele Nicola 925 458 6697 or toll free 800 889 4795. October 6, 7, 8, 9 and 10, 2004 - New Jersey, Rakassah of the East, Fahtiem will be teaching and performing. For information 908 996 0269. Fahtiem will be teaching on Wed, Oct 6 at 7:20 pm and on Oct 9th at 9:00 am. She will be performing at 4:50 pm on October 9, 2004. October 23, 2004 - Canyonville, Or - at the Seven Feathers Hotel and Casino Resort, Jareeda sponsors Fahtiem in workshop and show. Contact Mezdulene at 541 459 3115. October 24, 2004 - Sherman Oaks, Ca - Fahtiem will be performing for King Tut Returns, Dinner and show, Halloween Bellydance Extravaganza. Contact Anisa at 818 908 8008. November 5, 6 and 7, 2004 - Dallas, TX - Isis presents Fahtiem in a 2-day workshop and show. Call 888 918 4747 for more information. Back by Popular Demand! November 19, 20, and 21, 2004 - Frankfurt, Germany. Momo Kudus presents Fahtiem in a 2-day workshop plus two shows, Friday and Saturday evening. November 30, 2004 - Los Angeles, CA at The Dancer's Studio, 5772 West Pico Blvd, corner of Pico & Ogden, 2 blks East of Fairfax. Rhythm workshop for dancers with Karim of Turbo Tabla. 9:30-11:30 pm. Call Fahtiem for reservations. December 31, 2004 - La Mirada, CA - New Year's Eve - 9:45 pm. Fahtiem and the Sultan's Delites at the Holiday Inn in La Mirada. Dinner, Show, Live Arabic Band. Call Fahtiem for more information. February 15 and 16, 2003 - Long Beach, CA - Fahtiem will be a judge for the Belly Dancer of the Universe contest. For info contact Atlantis 562 433 6615. March 23, 2003 - Richmond, CA, - Rakkassah of the West, Fahtiem will be teaching Sunday, Mar 23rd at 9:00 am. Performance time: 3:16 pm Main Stage. Call 510 724 0214 for more information. April 11, 12 & 13, 2003 - Atlanta, GA - Fahtiem in Workshop and Performance - Contact Elisheba Zoheret of Golden Veil Productions (770) 434- 0197. May 22, 2003 - Long Beach City College - Performance for Cultural Fashion Show. Curtain call at 7:15. Show begins at 7:30. Fahtiem opens the show! Call 562 938 4192 for tickets and information. Tickets are $10. June 20, 21 & 22, 2003 - Orlando, FL - Beledi Productions presents Festival of the Nile, featuring Fahtiem in Workshops and Show. For Information contact: Shari Bernard 407 656 7524. July 13, 2003, Laguna Beach, CA, at 6:00 pm, Fahtiem will be giving a performance to live music, at the Sawdust Festival. July 15, 2003, East Los Angeles, CA, Fahtiem will be doing a lecture and performance at the East L.A. Public Library at 4801 East Third Street, at 6:30 pm. July 24, 2003, New York, New York. Fahtiem will be performing. August 2 and 3, 2003, City of Industry, CA, Oasis Dance Magic. A weekend of workshops and a Gala Show. Workshops by Fahtiem and Amir Thaleb. Vendors, shopping bazaar, big beautiful ballroom. Show will include many artists from around the world. August 15, 16, & 17, 2003 - Dallas, TX, Fahtiem will be doing a workshop and show at "A Gathering of the Stars," presented by Isis. Call 888 918 4747 for more information. Back by Popular Demand! September 5, 2003 - Dallas, TX, Fahtiem will be doing a performance in an all-star show with Dina of Egypt. Contact Little Egypt toll free at 800-801-0604 for more information. September 19, 20, 21 and 22, 2003 - 4 day, 3 night Baja Cruise to Ensenada, Mexico featuring special guest artists, Fahtiem, Zahra Zuhair, Kamaal, Kajira Djoumahna, Aziza Sa'id, and with Reda Darwish and Friends. For information call Michele Nicola 925 458 6697 or toll free 800 889 4795. www.arabiannightsatsea.com. September 27, 2003 - Corona, CA, Civic Auditorium, 815 West 6th St., Outdoor Bazaar 11am - 5 pm, Festival of Dancing Color PLUS Gala Evening Show 6:00 - 8:30pm. Fahtiem will be performing in the evening show. Call 909 874 1249 for more info. October 4, 2003 - Irvine, CA - A special Caspian Night at the Caspian Restaurant, at 7:00 pm. Reservations a must! Please mention Fahtiem. To make your reservations, call 949 651 8454. For more info, call Fahtiem. October 12, 2003, San Diego, CA - Fahtiem will be performing at the Bedouin Bazaar at 4:30 pm with John Bilezikjian. For more info call Scottie Schultz at 858 584 0135. November 2, 2003 - Sherman Oaks, Ca - Fahtiem will be performing for King Tut Returns, Dinner and show, Halloween Bellydance Extravaganza. Contact Anisa at 818 908 8008. November 23, 2003 - Long Beach, CA - Fahtiem presents Nourhan Sharif in Special Workshop. Package can include MECDA Anniversary Party. Workshop from 12:00 - 3:30 pm at Warldow Park. For more info call Fahtiem. December 8, 2003 - 7:30 pm. Long Beach, Wardlow Park. Fahtiem's Annual Christmas Pot Luck. John Bilezikjian will be playing and guest dancers will perform. January 19 and 20, 2002 - Las Vegas, NV - Fahtiem in Workshop and Show. Contact Lisa Kraemer 702 646 5068. March 24, 2002 - Richmond, CA - Rakkasah - Fahtiem will be performing on the main stage with live music at 4:34 pm. For further info call (626) 810-9470 or 626-810-SHOW (7469). May 2, 2002 - 4 day, 3 night Baja Cruise to Ensenada, Mexico featuring special guest artists, Fahtiem, Margo Abdo O'Dell, Kamaal, Kajira Djoumahna, Aziza Sa'id, and with Reda Darwish and Friends. For information call Michele Nicola 925 458 6697 or toll free 800 889 4795. www.arabiannightsatsea.com. June 8 and 9, 2002 - Glendale, CA - Cairo Carnivale. Come visit Fahtiem at her booth upstairs. She will be performing on Sunday at 2:14 pm on the upstairs stage. August 3 and 4, 2002, City of Industry, CA, Oasis Dance Magic. A weekend of workshops and a Gala Show. Workshops by Fahtiem and Amir Thaleb. Vendors, shopping bazaar, big beautiful ballroom. Show will include many artists from around the world. August 17 and 18, 2002, Dallas, TX. Fahtiem will be doing a workshop and show at "A Gathering of the Stars," presented by Isis. Call 888 918 4747 for more information. September 28 and 29, 2002 - York, PA - Fahtiem in Workshop and Show, Contact Chandra Sereen (717) 764 8915. November 3, 2002 - Sherman Oaks, Ca - Fahtiem will be performing for King Tut Returns, Dinner and show, Halloween Bellydance Extravaganza. Contact Anisa at 818 908 8008. November 24, 2002 - Lakewood, CA - MECDA 25th Anniversary Party. Fahtiem will be performing. email mecda@earthlink.net for more info. December 9, 2002 - Wardlow Park, Long Beach, CA - Christmas Pot Luck. John Bilezikjian playing. December 11, 2002 - Fahtiem will be appearing on AT&T Broadband Television on Crystal O'Kelly's "People to Know" (half hour show all about Fahtiem) every Wednesday at 7:30 pm starting December 11, 2002 through January 1, 2003. January 12 and 14, 2001 - Las Vegas, Nevada - Workshop on Sunday January 14 and Show on Friday, January 12 (not Saturday) March 25, 2001 - Richmond, CA - Rakkasah - Fahtiem will be performing on the main stage with live music at 4:26 pm. For further info call (626) 810-9470 or 626-810-SHOW (7469). April 15, 2001 - San Jose, CA - Una's Spring Spectacular presents Fahtiem in Workshop and Show. Contact Una (408) 453 1983. May 6, 2001 - SAN BERNARDINO, CA - Fahtiem will be doing a benefit performance - Contact Jule Barta (909) 864-2722. September 22 & 23, 2001 - York, PA - Fahtiem Workshop and Show, Contact Chandra Sereen (717) 764 8915. October 13, 2001 - Vancouver, WA - Jareeda, Mezdulene, and Zaina present Fahtiem in Workshop and Show with live music by Americanistan. Contact Mezdulene 541 459 3115 for information. October 28, 2001 - Sherman Oaks, Ca, Fahtiem will be performing at The Ventura (Restaurant), 13920 Ventura Blvd, "King Tut Returns," 7-10:00 pm. Dinner and Show and Costume Contest. Halloween Belly Dance Extravaganza. Contact Anisa at 818 908 8008 for details. November 3 & 4, 2001 - Atlanta, GA - Fahtiem in Workshop and Performance - Contact Elisheba Zoheret of Golden Veil Productions (770) 434- 0197. March 3, 4, & 5, 2000 - Midland Texas, Contact Karen Sharma, (915) 694 2891 March 25, 2000 - Rakassah - Sunday - Main Stage 4:34 pm., Richmond, CA. April 27, 2000 - Fahtiem is performing at Rio Hondo College in Whittier, California, between 1:00-2:00pm at the International Cultural Faire. April 28, 2000 - Long Beach (California) College, Student Union: International Cultrual Faire; Fahtiem performs between 7:00 - 8:00 p.m.
May 7, 2000 - Fahtiem - workshop (Palo Alto, California) Contact Azar (650) 361 0688. May 27, 2000 - Fahtiem in performance - Tribute to Bobby Farrah - (Orange Coast College, California) - Contact Antelika (949) 786 3111. November 3, 4 and 5, 2000 - Beledi Productions presents a 20th anniversary, Festival of the Nile, featuring Fahtiem and Judeen - Workshops and Show (Orlando, Florida). For Information contact: Shari Bernard, (407) 656-7524. November 10-13, 2000 - Performance and Instruction with Fahtiem. December 31, 2000 - NEW YEAR'S EVE with Fahtiem at the Caspian Restaurant in Irvine, CA. Special Show with Fahtiem and Raven and Zephira. March 21, 1999 - Richmond, CA - Rakkasah '99 - Main Stage 4:26 PM - Fahtiem with Live Band " Jazayer"
Feb.27-Mar.2, 1998 --Mexican Baja Cruise - Workshops and Show - Fahtiem, Aisha Ali, Baraka, Monica Bermudes - Music by Light Rain "Arabian Nights At Sea"
Mar.7, 1998 - Jareeda and Halima present FAHTIEM - Workshop/Show - Puyallup,WA. Mar.22, 1998 - Rakkasah--FAHTIEM--performes on main stage - Sun. Apil 4, 1998 - FAHTIEM in Show, Miss Inland Empire Pageant, Fahtiem also choreographer for event. April 25,1998 - FAHTIEM in Gala Show - Boston - Workshop teachers "Bobby Farrah & Velerie Camille"
Dec. 31, 1998 - Fahtiem & "The Sultan's Delites" at the beautiful" "CASPIAN RESTAURANT"